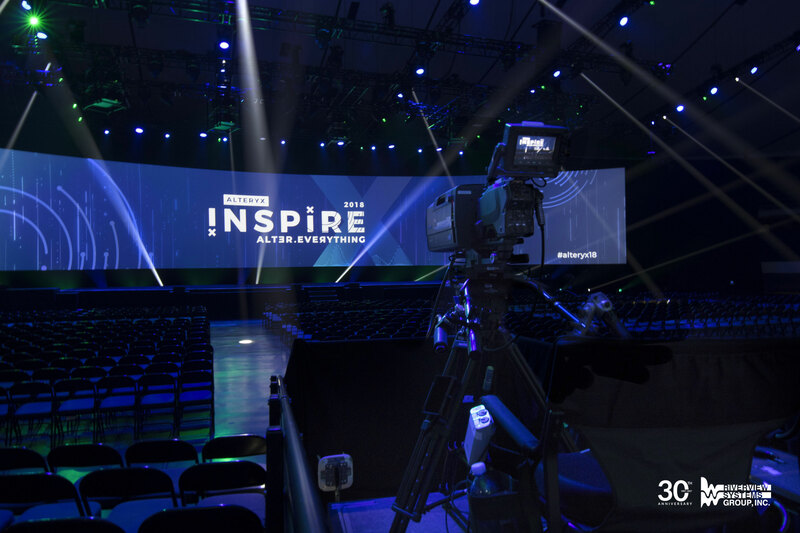 Riverview Systems Group Heads Into the Arena for the Alteryx ‘Inspire 2018’ User Conference | Riverview Systems Group, Inc.
Riverview provided fully integrated production services, including extensive pre-production, concept development, content management, scenic design and full-scale lighting and audio support. 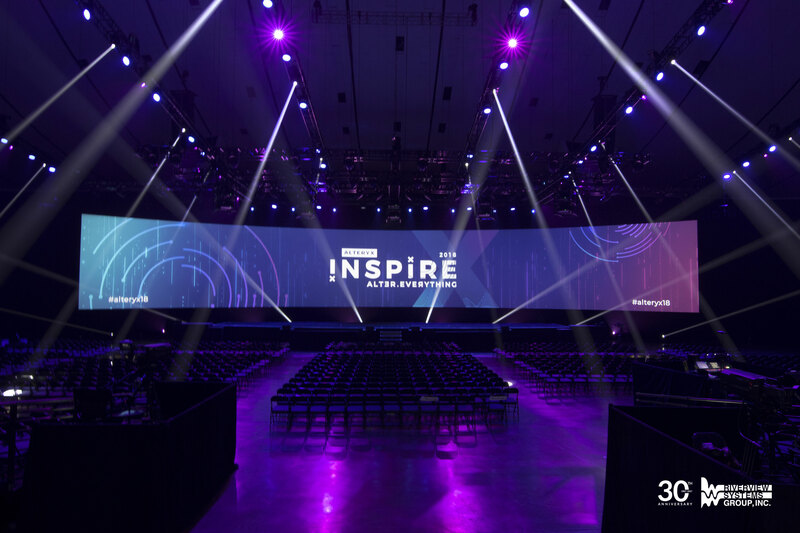 The company also collaborated with content creation agencies who created original video content that was displayed on an arena-style general session main stage, featuring a 145’ wide curved projection surface. To complete the experience, Riverview provided AV support for more than a dozen break-out training and meeting spaces, featuring two days of intensive and highly sought-after Platform Training. Riverview also supported the Solution Center, where attendees could meet and talk informally with Alteryx experts. Riverview spent the past five months advancing the show for Alteryx to ensure the client’s preferred staging concept and show content could scale in an arena setting. Johnathan V. Regnier, director, design, and marketing for Riverview, who oversaw the pre-production and technical design strategy, adds that this year’s Alteryx “Inspire” venue presented new design challenges. Since 1987, Silicon Valley-based Riverview Systems Group, Inc., has been providing the world’s leading brands with the technical and production design expertise to successfully produce engaging and innovative live events The award-winning, full-service provider of audio-visual resources specializes in the rental, sale, design, installation, and implementation of lighting, sound and video systems for corporate, retail, museum, and educational markets. Recognizing that creative delivery of digital media is the new frontier of event staging today, Riverview offers a comprehensive array of technical and creative services, as well as an extensive inventory of state-of-the-art, well-maintained equipment including cutting-edge wide-screen projection, media server delivery, and LED display technology. Riverview works hand-in-hand with clients to share their expertise and accommodate any sized production to deliver extraordinary brand experiences.